It is a given fact that during this day and age, for a business to be successful advertisement about the product/service is a necessity. This can be done through various media such as radio, television, and internet and most importantly through social media by the social media manager. Reaching through the social media has a great impact, since it reaches out to a large population of youth and adults alike. When seeing such posts about the event or the product, we can’t help but try to find more information about the product. This includes looking up on google and searching for why this product is so important and seeing the reviews of fellow customers will add more fire to the curiosity of the user. This rise in advertisements means more opportunities for social media manager positions and other professionals in the mass communication industry. The New York Times had reported sales of 1.3 trillion for companies just on the basis of social media advertisements. So such a boom means more and more competition within the communication industry. Here, you can mention about your previous work experience and mention how many big accounts that you have managed. Try to explain what kind of projects you have done and try to explain what kind of practices that you used to get a large following on social media and other websites. Also mention the various strategies used. This shows your versatility and adaptability in working in the industry. 2. Which social media channels do you recommend for the business that you have applied? Make sure you have done proper homework regarding the information about the business, study about the target audience and try to find out what the audience needs. Compare the facts and results about various social networking sites and try to compare with all of them. This will help you to answer such questions easily and without much fuss. Try to be informed about the business beforehand. 3. What do you think the goals of our social networking sites should be? As per the previous question, the answer depends on what is the company’s goals and perspectives. You can try and search for what they have done in their previous projects and try to understand what their job focus was. You could add further suggestions if you want. Also, try to ensure that the goals stated are reachable and are within the limits of the user. 4. What strategies would you implement for getting a better lead in the industry? Try to share as much facts as possible. Try to discuss about various strategies that can be used to increase the various businesses and what made it successful. You can also add instances from your personal experience. Also explain about a brief suggestion on how you could increase the business of the company. 5. What are the important marketing brands that should be followed when looking out for increasing business in the industry? There are mainly two basic factors that are important for the growth of an organisation through social media. Whatever the channel or media through which the product is being advertised, there should be some kind of conversational or interesting aspect about your product. There should be some kind of drive that attracts people. Content about the product should be the main factor for people’s engagement and drive their attention towards the project. Your candidate should be well versed and equipped in writing content about the product and should have creativity in writing. Have they organised or run any campaigns or drives that have produced a considerable amount of leads for ads via Facebook or twitter or any other social networking site? Organic leads or non-paid advertisements are also essential for the success of the product. This shows how much interest the individual or the candidate shows for the product. Leads is just as important than posting adverts on websites because it shows how much response the product gets from the people interested or the public in general. 6. Are they interested both in social advertising and also in social customer service? As a candidate, try to define what social marketing and social customer service is and differentiate between the both. Social marketing environment: The former calls for a more relaxed approach. Try to make a conversational approach. The main purpose of social media marketing is that it doesn’t usually revolve around the sales and similar boring information. The candidate should try to recognize a potential buyer and try to help them in purchasing the product and reach their final destination. Social customer service: Such processes requires an environment where the employee should have enough patience, empathy and the determination to solve the problem faced by the customers. Just because the customer brought doesn’t mean that the service between the customer and the company has ended. The main success behind a product lies in the fact that there are sales employees trying to help in every step of the way starting from the purchase to the assembly. The employee should have enough patience for this process. This is because such service not only caters to the present process but also to the future customers. 7. What are the most important things that a social media manager should be doing? A satisfactory answer should be that a social media manger should always try to listen to the call of the customers and try to understand the needs of the customers. This also includes constantly monitoring the needs and taking note of the various trends seen in the social media channels and its associated networks. Engaging regularly with the fans and customers shows that the employee has empathy and that they truly care about the doubts and needs of the customers. This also shows that you have the ability to listen to the needs of the customers and can effectively guide them in buying a product tailored for their size and interests. 8. Have you ever had to handle a social reputation disaster or crisis? Ask them about any social situation or crisis. What measures did they take to solve such issues? What all necessary protocols were taken? What were the after effects of such measures? How did you explain the phenomenon to the customers and the followers? If a person has taken necessary measures then they’ll find it rather easy to answer such questions. This is also the best time to consider the company’s policy measures while learning from the experiences of such candidates. This will help you to develop your social media policy and may also help you to develop a better rules and regulations for such situations. 9. How would you allocate budget for social media advertisements? When asked such questions, try to include a plan that is beneficial for the company. Try to allocate budget in a reasonable manner and try to ensure that goal of the company is feasible and is easy to reach. For example: For a typical company, a Facebook advertisements costs about $500 per month. This also includes the royalty and distribution rights of the product for proper advertising. 10. What is your first goal and priority for social marketing? How will you try to collect such a large number of fans? How will you engage such a large number of Facebook audience and try to make them interested in the product. Try to add the fact that a large audience numbers doesn’t mean an increase in sales. But creating a trust among the audience and improving the relationship and trust within the fans will create a large increase in sales. 11. Tell me a story which was memorable to you when working in this industry? This is a trick question. Try to answer such questions with utmost sincerity and honesty and at the same time make it interesting for the interviewer. A candidate who has skills in telling a compelling story is considered as an asset because he/she will naturally have the ability to write compelling content about the product. This can act as a huge advantage in social media and other platforms. This can also prove that the candidate can have the power to paint a picture in the customer’s minds and provide interesting contents to engage the attention of the customers. Also try to add the fact that why customers will buy from you rather than buying from the rivals and other competitors. 12. 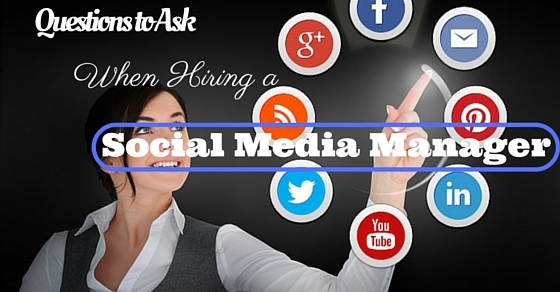 What attracted you for a job in social media? This is usually an important question asked in the interview. Try to answer in such a way that the employer will think that you will be an asset to the company. Try to be modest and state facts such as there is a large room for scope and environment and that you want to be constantly updated as an individual. This shows the employer that in the long run you are the type of employee that thrives in risks and under pressure. This shows that you can easily survive in the long run. 13. Are you aware of the recent social media trends? If you fail to answer this question, then it basically means that you have failed the interview. A huge part of the job as a social media manager is understanding the latest trends and practices within the industry. Try to be at least updated about the latest trends, so that you won’t be taken back by such questions during the interview. This proves to the employer that as a potential job seeker you are always prepared and ready for what is next and is prepared to handle any changes in the industry. 14. How is ROI defined and perceived in the social media? ROI can be easily measured in social media. Try to assess basic factors such as what all goals have you planned? Have you successfully completed all of them? If so, then you’ve had a successful ROI. A successful ROI do not need to be always associated with business and its growth. The real success lies in how well the ROI can be perceived so as to increase the business benefits. Try to state what all factors can be measured and how those factors can contribute to the growth of the company. 15. Could you give us an example on the limitations of social media in this day and age? A social media manger should always know the limitations that a social media has on all kinds of people. This includes, unpopular within the older age group, bandwidth limitations, character limit, accessibility to network and internet, API calls etc. If a social media manager has never come across a social media limit, then this shows that the candidate is less experienced. As a matter of fact, they might be rather new to the social landscape. Asking them how they respond to such limitations and how do they solve them shows how well they react to adversity. 16. What all plans will be our competitors be doing? For any kind of individual, before going for the job, try to gain and access information about the competitors as much as possible. This can help you make a better strategy. A social media manager can help you give an insight on the different methods that the competitors are using on their social networking sites such as Facebook, twitter, YouTube and LinkedIn. This can be fully researched and it shows their reactiveness and organisational skills.